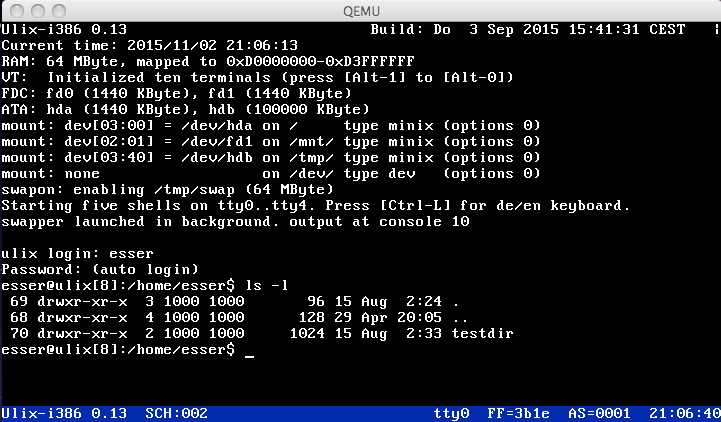 Ulix (Literate Unix) is a Unix-like operating system that was developed at University of Erlangen-Nuremberg. We used Donald E. Knuth's concept of Literate Programming for the implementation and documentation. The intention was to create a fully working system which can be used in operating system courses to show students how OS concepts (such as paging and scheduling) can be implemented. Literate programs are very accessible because they can be read like a book; the order of presentation is not enforced by program logic or compiler restrictions, but instead is guided by the implementer's creative process. Ulix was written in C and Assembler for the Intel x86 architecture; for literate programming we used Norman Ramsey's noweb tool. Ulix has already been used five times in operating system courses at TH Nürnberg (Nuremberg Institute of Technology) and University of Erlangen-Nuremberg; lecture slides and videos in German language are online (see below). 2015/11: Thomas Cyron received a Förderpreis der DATEV eG award for his bachelor thesis in which he described the implementation of pipes for Ulix.